First, sit about 18 inches from the computer screen. Then, hold the thumb of your right hand 5-6 inches in front of your eyes, between you and the screen. Now, focus directly on your thumb. You should see two images of the circle in the background. Now, focus directly on the circle. You should see two images of your thumb in the foreground. Don't worry, this kind of double vision is a normal process of your visual system. The brain and eyes work together so that you see double of whatever you are not focused on directly. If you see these double images, your eyes and visual system can respond well to The Read Without Glasses Method. The method is easy to learn and simple to use and people have seen results with as little as six minutes a day of practice. 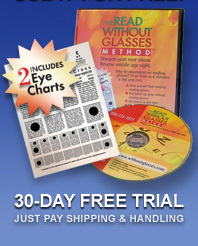 With The Read Without Glasses Method you could regain a youthful flexibility to your visual system, thereby sharpening your near vision, reversing middle-aged sight and reducing or avoiding dependency on reading glasses or bifocals. * This test and use of The Read Without Glasses Method require two functioning eyes. The method is not for people with amblyopia (lazy eye), only one functioning eye, eye turning problems (squint) or low vision problems.